I’ll be the first to admit, part 1 of this 2-part vocabulary set was HUGE. Be prepared, because this one is pretty beefy too. But after reading these two vocab posts, you should have a really good foundation to build on! And they’ll be here for you to refer back to. 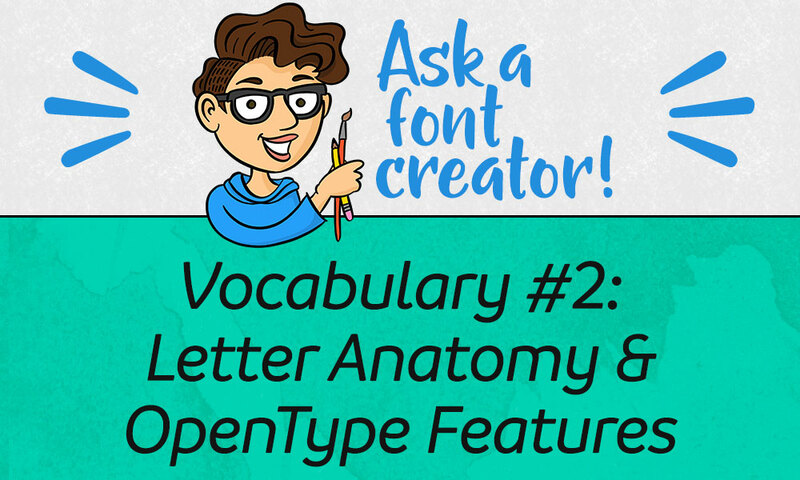 Today, we’re going to cover the anatomy of letters, as well as some features that come with OpenType fonts. So let’s dig in! Let’s start out with the five horizontal guidelines that font creators work with when crafting their letters. All of these guidelines are adjustable during the creation process, so designers can keep their letters uniform in height. Ascender Height: This is the absolute tippy-top of the tallest letters. If a letter has an accent mark over the top of it, that mark should also stay under this guideline. Cap Height: This guideline gives the designer an idea where the tops of the capital (uppercase) letters should line up. (And in some typefaces, the tops of tall lowercase letters like b, d, and f will also touch this line.) Though weirdly, if a letter has a rounded part (think O, G, Q, etc.) then that curve will probably go a little higher than the cap height. A flat top always looks a little taller than a curved top when they’re actually the same height, so we make those curves a little taller to create an optical illusion that they’re the same height. Baseline: This is the line on which all letters sit, no matter how tall they are. Descender Height: This is the lowest point any letter should go. Like the Ascender Height up at the top, no letters, parts of letters, or accent marks should go below this line. Now we’ll get into a few of the parts of the letters themselves. Believe it or not, this is a limited list—I could name three times as many parts, and I still wouldn’t cover it all! But these are the biggies. Ascender: The part of a lowercase letter that falls above the x-height (reaching toward the ascender line). 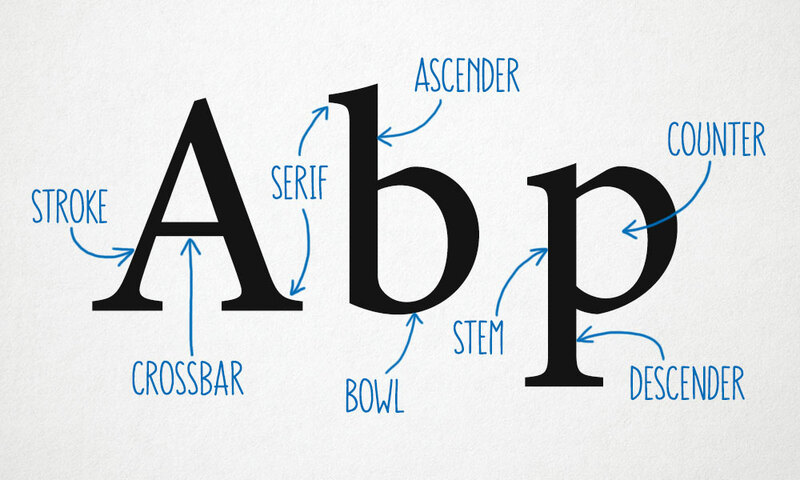 Descender: The part of a lowercase letter that falls below the baseline (reaching toward the descender line). Stem: The main thick, heavy line that makes up the backbone of a letter. Stroke: A supplemental line or curve that works with the stem, but isn’t as heavy. Crossbar: A horizontal line connecting stems and strokes (like in a capital A or H). Bowl: A curved stroke that contains an enclosed space. Counter: The space enclosed by a bowl. If it’s completely encased, it’s also called a closed counter. 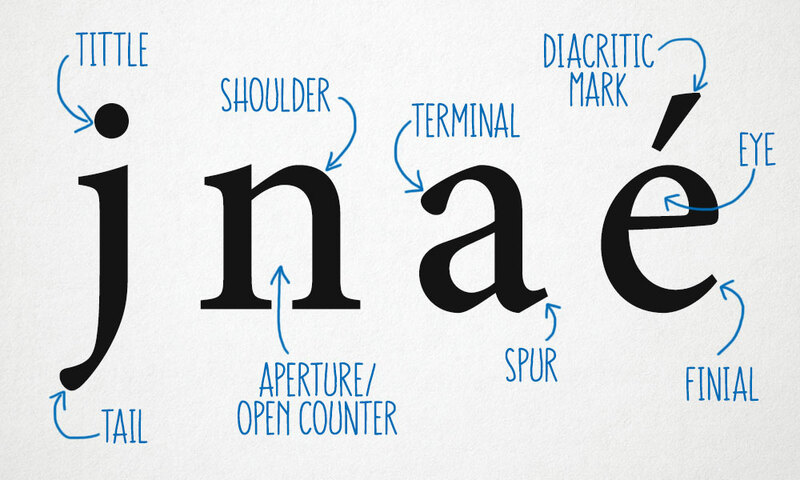 Serif: The wee feet at the tops and bottoms of letters in a serif typeface. Tittle: Another word for the dot over a lowercase j or i. You could also call it a dot, but how boring is that, when we have a word like tittle available? Tail: A descending stroke that ends a letter. 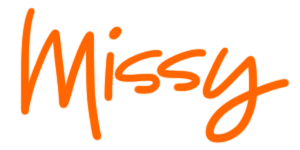 Used on lowercase letters like j, y, p, and q, as well as uppercase on the Q, and the lower diagonal strokes on R and K.
Shoulder: a rounded, downward stroke that comes off of a stem. Aperture: A semi-enclosed rounded space. Also called an open counter. Spur: A small decorative stroke off of a main stroke or stem. Usually just decorative, kind of like a letter’s appendix. Diacritic Mark: Sometimes just called diacritics, these are the accent marks used in a variety of languages to indicate alternate pronunciation. Eye: This one’s specific to one letter: it’s the small counter in the lowercase e. I’m including it here because if you’re anything like me, from now on you’ll always think that e is looking at you. You’re welcome. Finial: The tapered end to a letter. As you can see on the e (which is LOOKING AT YOU), it’s a terminal (though not a ball or teardrop terminal), but not really a tail, because it’s short and not descending. Onward we go! This last section of vocabulary is going to go over a lot of features that are included in an OpenType font. A lot of software can work with these features so that you can switch between regular letters and fancy-featured letters with the press of a button. Unicode: Let’s start with a brief bit about how fonts refer to letters. In the inner guts of a font, each letter is given a specific code (made up of either just numbers or letters and numbers) that lets all software know what letter it is. So an uppercase A is always coded as “0041” (or sometimes referred to as “U+0041,” with the U to indicate “Unicode”). Thanks to Unicode, every common character has a specific place, and every software program knows just where to go to find those characters. 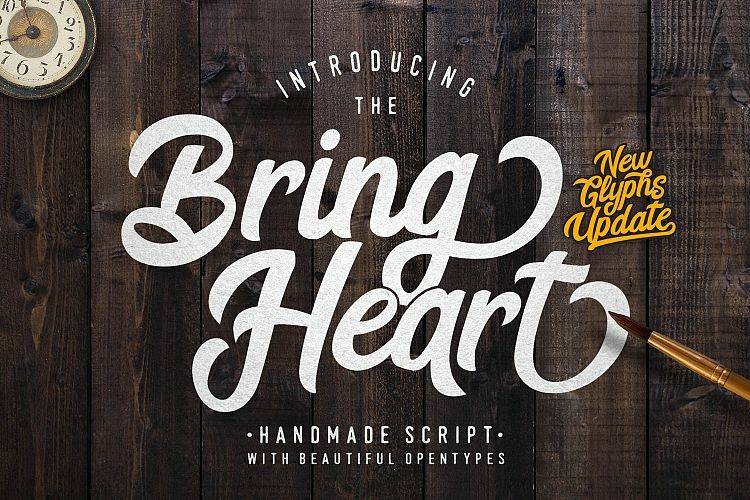 Now, on to some fabulous features you’ll find in an OpenType font! For these examples, I’ll be coloring in the parts I’m talking about blue. Swash: One of the most commonly seen bonus features, these are alternate versions of letters with decorative flourishes attached. 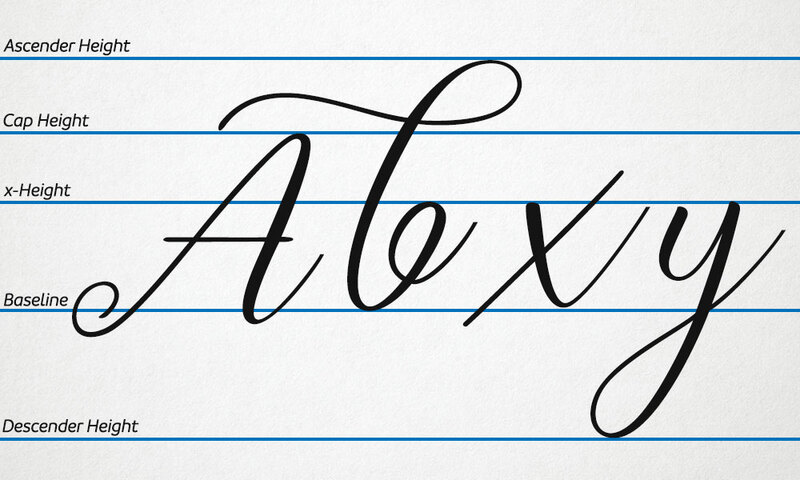 Swashes can be attached to the left side (an initial swash) or the right side (final or terminal swash) of a letter. Kerning: Kerning isn’t just an OpenType feature—it’s been coded into older font types (like TrueType fonts) as well. Kerning is the distance between any two given letters. If it’s set too wide, like in the example above, you get a terrible-looking gap. But when it’s just right, the letters nestle perfectly together. There are tons of “standard” kerning pairs that all fonts need a little adjustment with, but a designer can also add in their own pairs. In my “What’s Your Process?” post, I showed just a few pairs out of the 440 I start out with on every font. Ligatures: These are individual characters made out of multiple letters to help those letters fit better together. Sometimes it’s just an odd fit between two, so tickling them and then welding them together into one makes everything prettier. Ligatures can also be created for other reasons: in the example above, the “th” doesn’t look bad normally, but a ligature has been created to make them really pop together. Designers can also create ligatures of double-letter pairs—especially in a script font, it can help add that handwritten look so you aren’t using two identical letters next to each other. Stylistic Alternates: These are extra versions of letters that a designer throws in to spice up their alphabet. In this example, there are two different alternates being used for the T, to add more flair to what you’re creating. In a script font, these alternates might also offer connecting or non-connecting options to make words flow better together. Contextual Alternates: These are very similar to stylistic alternates, but they’re instances where the designer thinks a letter is great next to almost every other letter, but in certain instances, it would look better another way. So in this example, the unconnected lowercase t follows the curve of the lowercase e, making that pair really pleasing to the eye. You can see the connecting t farther down the line. It would be just fine to have that connecting t leading into the e, but this alternate lends a little extra unity and flair. Oldstyle Figures: You’ll mainly find these in more straightforward serif and sans-serif fonts (not so frequently in script fonts). Regular sets of numbers are all the same height as capital letters, but these oldstyle numbers are an alternate set that follow the bounce of lowercase letters (some taller like ascender letters [b, d, f], and some lower-set like descending letters [g, q, p]) to make reading easier. Ordinals, Superior Letters, Numerators, Denominators, and Fractions: Alternate smaller-sized letters and numbers that sit up high or down low, depending on what they’re needed for. They help to make celebrating your birthday with a glass of H₂O and a trip to Platform 9-¾ as fun as it can possibly be.